This week the Research Studio 3 DIGITAL MATTER – INTELLIGENT CONSTRUCTIONS partook in the Adaptive Self-Parametrisation workshop, in parallel with CITA. The workshop was held by David Stasiuk – digitalization of the physical models for the self parametrization -, Henrik Leander Evers – 3D scanning expert -, as well as the RS3 studio directors: Areti Markopoulou with Mette Ramsgaard Thompsen – CITA - and tutor Alexandre Dubor. The parametric model is limited by the need for defining all parameters at the start of the design process. This is contrary to the nature of design as a process of discovery. As any designer knows, the design space is dynamic changing as new information is discovered, understood and synthesised. This workshop investigated the creating of self parametrisising models. Models that learn their parameters during the design process. 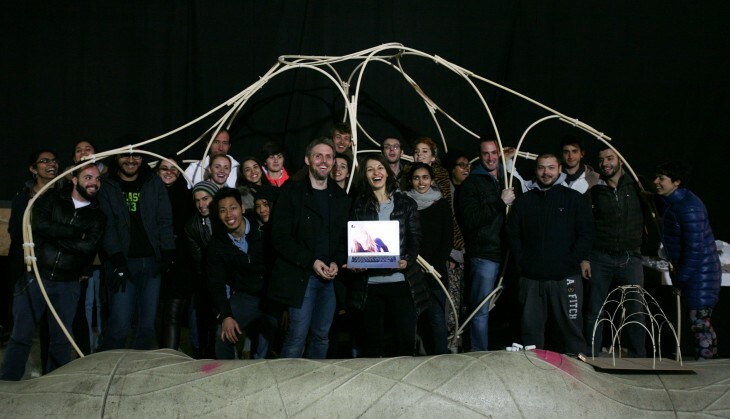 By merging crafts based material knowledge with computational strategies for generative design, the workshop asked the students to think about how evolutionary systems can be implemented as conceptual as well as practical design tools. Taking point of departure in the building of a vault we want to create a design system that explores the breadth of a design space so as to understand how a network of single arches performs together and how they can be constructed. The workshop was undertaken in sequence a parallel workshops between IAAC and CITA. The first step was to construct a training set by which the algorithm can learn about its performance. The material chosen to develop the workshop was rattan – a tropical root, traditionally used to create wicker furniture. Through scaled modelling the material behaviour of rattan was exploited to create active bent arches that joined to create vaulting conditions. A large set of design solutions that explored the design space were developed through the engagement in algorithmic thinking, exploring the design space of a set of given parameters. Over 200 models were created in the space of just over 12 hours. The second step was to transform the vault models into computational models that could be addressed by the algorithm. The digital models used spring based modelling (kangaroo) to model the material behaviour of the rattan. The 3D scanner was used to digitise the physical models, that were then used as trace models by which to calibrate the simulations. The digitised models used as topology setups were then addressed by the genetic algorithm. Through the use of evolutionary systems we then let the computational system explore the design space examining different kinds of fitness criteria and creating a new generation of design solutions. The third step was to test the resulting learnt vault in full scale, where the preferred solution was then built in the form of a 1:1 prototype using rattan.